Don’t make Kyle Schwarber angry, you wouldn’t like him when he’s angry. Maybe someone should have provided third base umpire Gabe Morales with that advice prior to his controversial swing call on the strike that ended Saturday’s game. It was all Javy Báez could do to keep from being tossed aside like a rag doll, and even the physically imposing Jason Heyward was little match for the incensed rage monster. 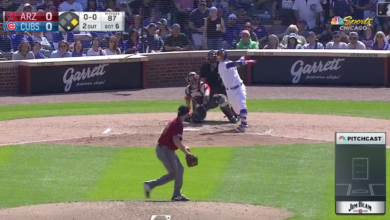 The magnitude of the moment obviously contributed to Schwarber’s anger, but a not-insignificant factor in his volcanic explosion was the pent-up tectonic pressure of his struggles at the plate. Schwarber has now struck out 10 times in the last four games, all but one of which have been swinging and all but two of which have come on sliders or curves. Saturday’s game-ender was a knuckle curve in the dirt from Angels closer Cody Allen that Schwarber started to offer at before trying in vain to check his swing. It’s nearly impossible to tell in real-time, especially from the center field camera that offers precious little depth perception, but Schwarber’s quick reaction to pull the bat back makes it appear as though he checked and should have been on first with a walk. Guess the Cubs will be hoping for meatloaf after Sunday’s rubber game.